There were interesting round of Under 17 Women World Cup games this year at Azerbaijan. The games which were held from Oct 4th to Oct 13th, at the end saw record results for several women teams. 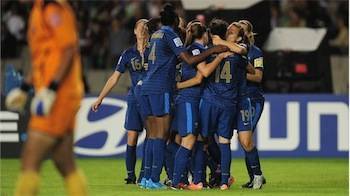 Amongst 16 competing teams, France youth women team managed to defeat defending champions, DPR Korea, in the Final in a shoot-out, for the first time in their history. Also Ghana, one of three qualified African teams, made it to the Final 4, for the first time in their history. Ghana in an astonishing result defeated Germany-one of the usual Top 4 contenders in U-17 championship games- to secure the 3rd spot. Therefore Germany took the 4th spot. It is worth mentioning that FIFA U-17 Women World Cup games were initiated as of 2008 only. Prior to that, Women youth teams would compete at U-19 World Cup games only. But back in 2008, FIFA, in order to expand Women youth development and women football for future, expanded the Youth games into FIFA U-17 and FIFA U-20 World Cup games. Since inauguration of U-17 women World Cup games, DPR Korea, South Korea and Japan have each won World Championships once, which only shows the successful investments of these countries in their women football. Also significant mention should be dedicated to other Top 4 teams of U-17 women World Cup games; teams such as United States, Germany, England, Japan, Spain and Ghana. Of which, SPR Korean U-17 women teams have had consistent presence among top 4 teams in all 3 rounds of this Tournament. Followed by DPR Korea, Germany has had significant presence; Twice making it to the top 4 teams, since initiation of this Tournament. A step in the right direction, based on these records and results of these under 17 women teams, one can foresee the future leading contenders in Women World Cup games.